Oh, so many things! This wedding suite is full to the brim of details I love. 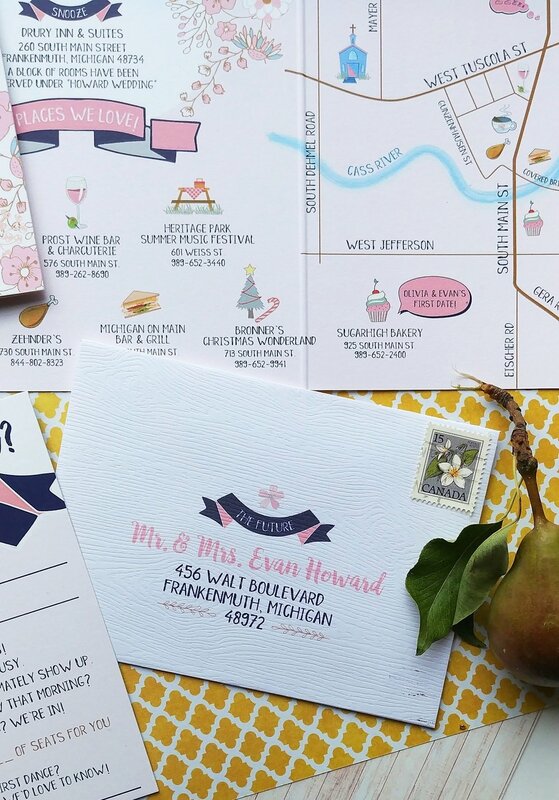 The bride, Olivia, found Cordial Punch Press on Instagram, but funny enough she lives only about 90 minutes away in an adorable town called Frankenmuth (if you're a Michigander, you know!) and we quickly discovered so many things in common, and our personalities just clicked. 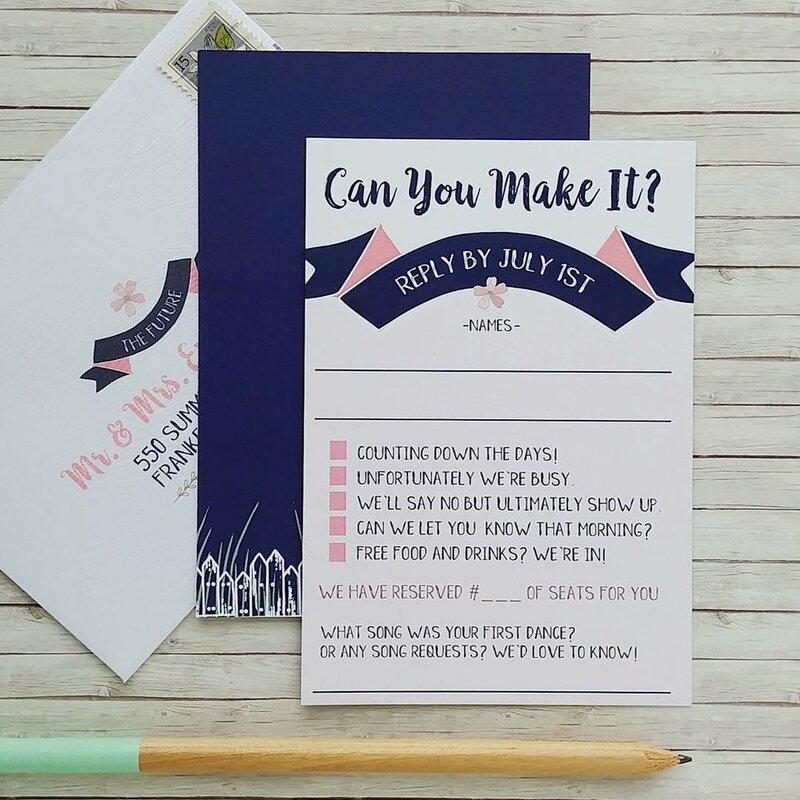 She described her wedding as whimsical, fun, ("Can the RSVP be sassy?" YES. ), informal, and can there please be a full map of downtown Frankenmuth? (again, YES.) Their reception was planned for the Farmer's Market, and she also had a special request to hide Mickey ears somewhere in the invitation (can you find them all??) We started with three initial drafts, and slowly morphed into the final booklet you see here. The map of Frankenmuth is my favorite, and boy was that a labor of love. 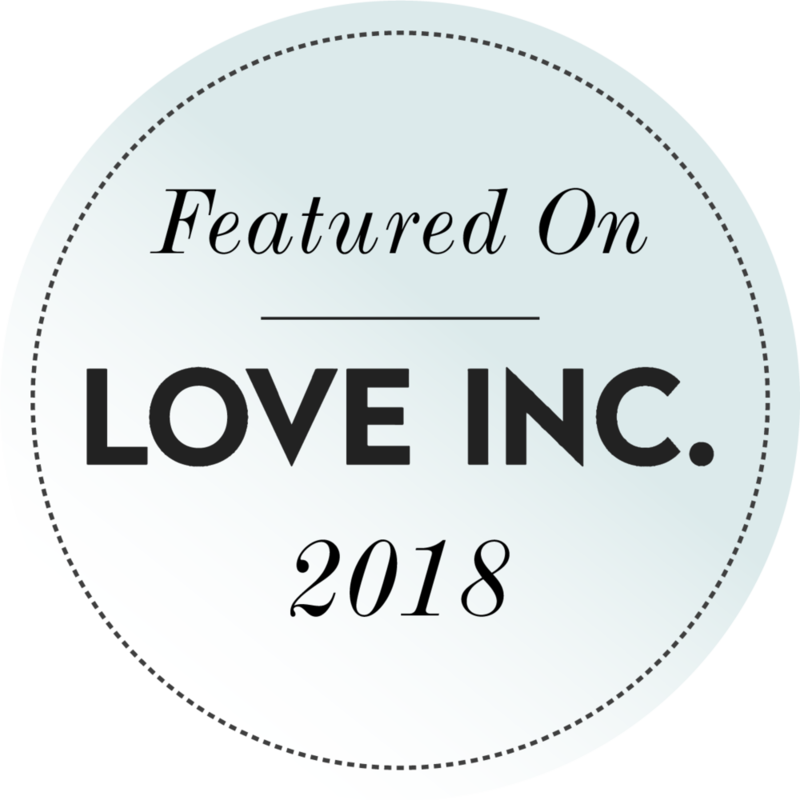 All of the couple's little details and favorite downtown spots are a great way to connect with guests and give them a peek into the love story. 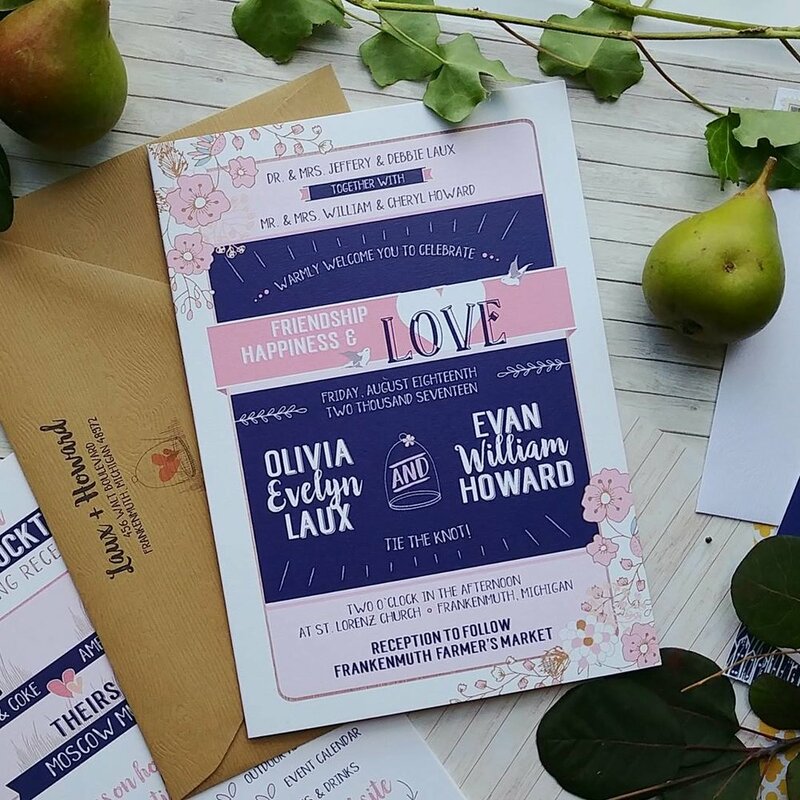 Olivia and Evan opted for wood-grain RSVP envelopes and mailing envelopes (amazing!) and as always their return address was pre-printed as well as the RSVP mailing address. After the invites went out, we also planned on the Day-Of essentials like Ceremony Program Fans, Table Numbers, a Poster Seating Chart, and Welcome Kits featuring the coolest things ever - canvas tote bags custom-printed with the wedding map AND personalized with names! I almost ordered one for myself! The Welcome Kit also included Water Bottle Labels, hilarious Door Hangers, and a Welcome Note. The same colors, fonts, graphics (that adorable cloche!) and vibe from the invitation suite were carried throughout. All of these little touches and attention to detail are what make a wedding truly stand-out. It's my absolute favorite when couples put their personalities into their wedding. Make it yours! As both a designer AND a wedding guest, I can't emphasize enough how awesome it is to see a completely personalized wedding. 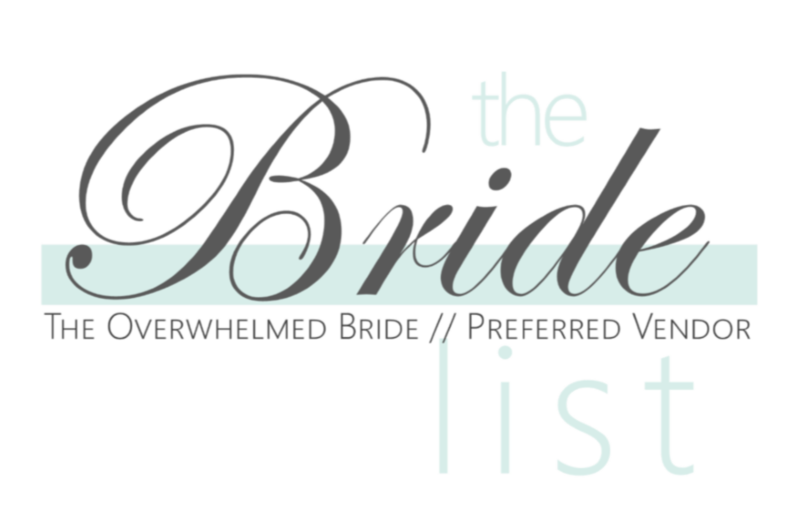 To see the gorgeous professional photographs from Olivia & Evan's amazing day, visit Jennifer Pierce Photography HERE. 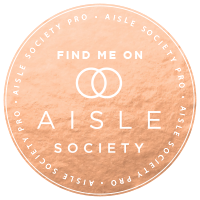 There's Mickey ears, glittery Rose Gold wedding sneakers, and so much more. 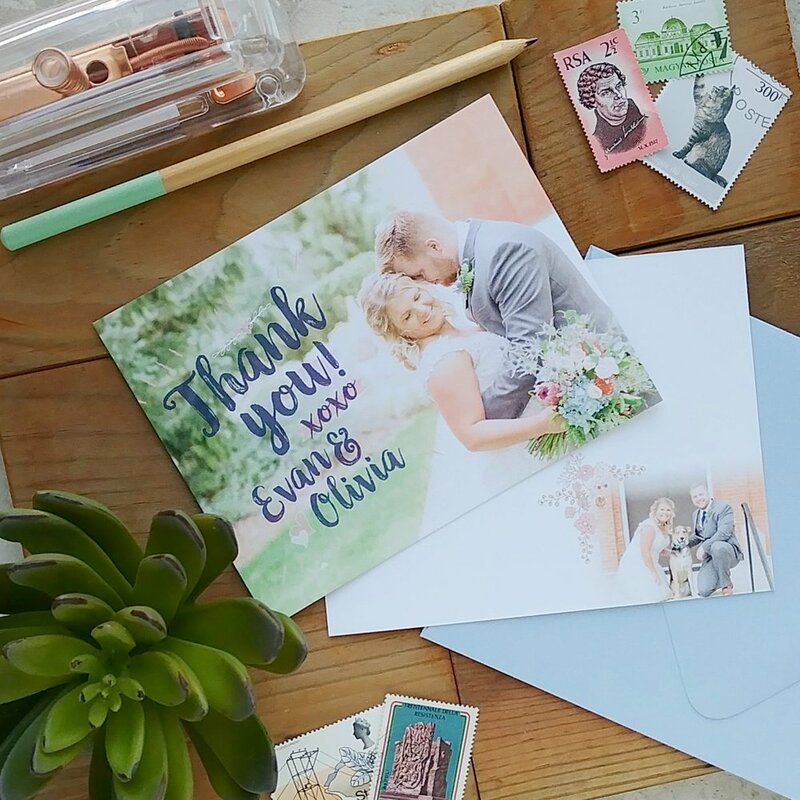 Jennifer's beautiful photos are also featured on their custom Thank You Cards. 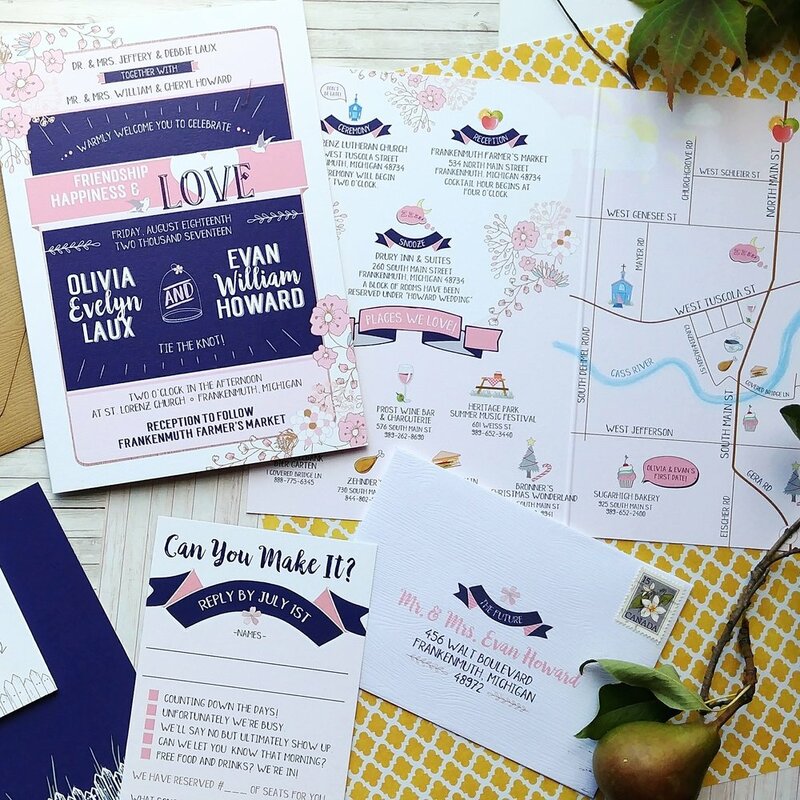 Olivia also has an awesome blog called Adventures in a Midwest-Michigan Marriage, and she did the sweetest write-up about working with Cordial Punch Press. (And yes, she did order Christmas cards and they ARE amazing!) Check her out HERE.